For a magician, deception and misdirection are the respected skills of a master. For William Robinson, the layers of deception in his personal life were as confusing as his tricks, making audiences and friends question what was real and what was illusion. Robinson was born in a trunk, as they say, in New York. His father, James Campbell Robinson, was a versatile performer touring with minstrel shows. He performed as Jim Campbell, and he specialized in ventriloquism, magic and singing in several dialects. He also worked as a stage manager at the Houston Street Concert Saloon, filling in on stage when necessary. Young Billy Robinson, as his family called him, wanted to follow in his father’s footsteps. He was tall and handsome with alluring eyes like his dad, but he lacked vocal talent and charisma. Singing was out for him, so he set his sights on becoming a magician. The young man used his father’s props to practice illusions in front of a mirror. Robinson started out performing at private parties and school assemblies. His first assistant was his younger brother, Edward. He opened with a short introductory speech and then he proceeded to mystify the audience with card and coin tricks and other sleight of hand. BEHIND EVERY GREAT MAN IS A WOMAN When Robinson was 21 years old he met 16 year old Bessie Smith, and they married in February 1883 after only a couple months’ courtship. Theirs was not exactly a mutual relationship. Smith was love struck and happy to be married. Robinson was happy to find a new assistant. In December a girl, Annie, was born, but the new Mrs. Robinson was not the mother. Robinson took custody of the girl, and his parents raised their first grandchild, perhaps as a way to save face for the family. Robinson created a larger-than-life stage persona in the tradition of the great magicians and toured around New York with his devoted assistant. They were billed as “Robinson, the Man of Mystery, The World’s Marvelous Enchanter, Assisted by Mlle. Bessie.” He tried to look the part with a handle bar moustache and black knickers and tails, and he started signing his correspondence “Mystically thine, W. E. Robinson.” When he added ventriloquism and mind reading to the act he promoted himself as “Robinson, The Man of Many Voices” and “The Famous Spiritualist.” For all his effort, reviews of the act were just tepid. Bessie gave birth to a baby boy, Elmore, in early 1885. Being a magician’s assistant required more than just handing props and hiding in boxes. It involved hours of intense rehearsal to perfect the illusions and a demanding schedule. Now, with an infant to care for, she needed to stay home, and Robinson needed to find a new assistant. A slim, diminutive showgirl with a young face struck Robinson’s fancy during one of the variety shows he performed in. She was the perfect size to hide in a box and had experience with the rigorous life of a touring performer. Her name was Augusta Pfaff, but she performed as Olive Path, and Robinson affectionately called her Dot because she was so small. She was just what Robinson was looking for as an assistant and a lover. WHAT’S YOURS IS MINE During a European tour Robinson was introduced to a new style of magic, Black Art, where black fabric and lighting were used to conceal objects. When he returned to America he immediately incorporated this new technique into his act. He copied the idea of adopting the persona of an Egyptian mystic from the originator of Black Art. Hiding behind an elaborate costume and the assumption that he didn’t speak English, Robinson found a new comfort level on stage. The magician and his assistant spent all their time together building, rehearsing and perfecting each illusion, and Robinson willfully ignored his family. Since he was Catholic, divorce wasn’t an option, so he and Bessie just pretended that they weren’t married. Robinson and Path started going by Mr. and Mrs. Robinson, and no one questioned them. Two of the most renowned magicians in America were Alexander Herrmann and Harry Kellar. As bitter rivals they competed for the most dramatic illusions and best talent to join their shows. Keller wanted Robinson to join his act to perform his Black Art illusions. Robinson accepted the offer for sixty dollars a week which included Path as the assistant and Robinson working backstage to set up the illusions. Keller changed Robinson’s character to Nana Sahib, the “East Indian Necromancer in Oriental Occultism.” During his tenure with Keller, Robinson developed a levitation illusion using a special harness and derrick he developed with machinist Benjamin Keyes. The troupe rode the wave of popularity for two seasons until Robinson got a better offer from Herrmann. He took his special harness and his assistant and joined Herrmann’s company. Both Robinson and Path played supporting characters in Herrmann’s illusions and also performed some of Robinson’s Black Art tricks. Herrmann did not approve of Robinson’s previous character name, so he became Abdul Khan. During the summer while Herrmann vacationed in Europe, Robinson and Path developed their own show, performing in the Catskill Mountains and in Boston. He revived the persona of great magician in tails, but he still didn’t feel comfortable as himself on stage. He had to admit that his best role was as an assistant. After two years with Herrmann, Robinson heard from Keller again. Keller had just returned from London with many new tricks, and he used the sketches for new illusions to entice Robinson to come back. He was hopeful that Robinson would take the bait and bring with him Herrmann’s best illusions. Robinson couldn’t resist. For the Black Art act, Robinson’s character went back to Keller’s name: Nana Sahib. In 1894 Herrmann, who usually preferred his older tried and true tricks, incorporated some new ones into his act. Two of them were virtually identical to ones that Robinson had developed with Keller. Now there was no doubt that part of Robinson’s value was because he stole secrets. He had plenty of secrets in his private life, too, that he wasn’t so eager to share. He and Path still maintained that they were married, but they weren’t. Robinson didn’t care about a family, so the legality of relationships was incidental. Bessie had “remarried” without a legal divorce from Robinson. Their son, Elmore, didn’t really fit into either family, so he was placed in an orphanage. Robinson’s life, like his illusions, was not all that it appeared to be. REINVENTING HIMSELF One of Herrmann’s new tricks was the Marvelous Bullet Catching Feat. He caught six marked bullets fired from rifles in the audience on a plate in front of his chest. Because of the risk and high dramatic value, he only performed it seven times for charity shows. Robinson was an indispensible assistant on this illusion as the person who ensured that the bullets in the gun were actually blanks. In 1896, Herrmann died, and Robinson decided it was time to have his own show. He tried to resurrect his vaudeville act, but he couldn’t overcome his bad teeth and shy voice. For a while, he and Path worked for Mrs. Herrmann who tried to continue her husband’s act to pay off the debt he left her. Robinson also wrote journal articles giving advice and leaking secrets to magicians. After two years of struggling, Robinson attended the Trans Mississippi Exposition in Nebraska and came face to face with his future. At the fair, Chinese magician Ching Ling Foo performed illusions he brought from China. He didn’t know English, so he performed in silence, using pacing and broad gestures to connect with the audience. Later, when Foo was the headliner in New York, Robinson spent countless nights studying every detail of Foo’s act from the back of the theater. In 1899 Robinson left Mrs. Herrmann’s company, and, with another stolen idea, set out on his own again. He reinvented himself as Hop Sing Loo, a Chinese speaking magician. He shaved his moustache and his hairline and donned a wig with a long braid in back. He used greasepaint to change his skin tone and purchased a costume from Chinatown. Path added to the deception by become a Chinese princess, and Robinson hired a real Chinese juggler, Fee Lung, to round out the performance. Robinson got an invitation from a manager, Ike Rose, in France to bring Hop Sing Loo and the troupe to Europe. Robinson sold his levitation illusion and collection of books to finance the trip. In March 1900, Hop Sing Loo appeared on stage for the first time, and the show was a disaster. Loo’s magic was slow and deliberate, and a trick involving a large bowl of water went awry, sending a cascade into the orchestra pit and drenching the musicians. Despite the opening night mishap, Rose managed to convince the theater owner to keep Hop Sing Loo on the bill for the contracted week, deducting the damages to the theater from his salary. Robinson settled into the role and refined the illusions, and he felt more confident as Hop Sing Loo than he ever had as himself. The next stop on the tour was London, and Rose made only one major change in Robinson’s act. He hated the name Hop Sing Loo and insisted Robinson change it. Ching Ling Foo was gaining in popularity in America, and since Robinson had already appropriated Foo’s character and a couple of his tricks, why not go all the way and imitate his name? Robinson became Chung Ling Soo, and Path became Suee Seen. There was virtually nothing in Soo’s act that was authentically Chinese. Since Soo (as he was known in the press) didn’t speak English, even talking to the press was another gimmick. A reporter would ask Fee Lung a question which he would repeat to Soo in actual Chinese. Soo would respond in Chinese-sounding gibberish which Fee Lung would translate back into English. 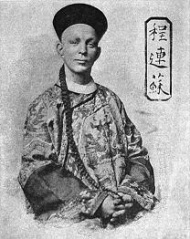 Even though fellow magicians and other performers knew that Robinson was Chung Ling Soo, the public embraced his talent and accepted the guise along with it. Soo became such a crowd-pleaser that he was earning about $5,000 a week with bookings two years in advance. The troupe grew to 14 people, including a new juggler/stage manager, Frank Kametaro, who was Japanese. Kametaro spoke Japanese and English but not Chinese. During interviews, he would translate the questions to Soo in his own version of gibberish Chinese, often sounding quite different from the fake Chinese his boss was speaking. None of the reporters seemed to notice as nothing was ever written about it. WILL THE REAL CHINESE MAGICIAN PLEASE STAND UP In 1904 Ching Ling Foo began a European tour in London. He was getting limited bookings because of Soo’s act. Foo challenged Soo to a duel of magic to prove who the real Chinese illusionist was. Foo set the terms. He would win if Soo failed to do ten out of twenty of Foo’s tricks, or if he failed at any one of Soo’s illusions. Robinson accepted the challenge. Robinson knew that losing could cost him his career. He solicited help from an old friend for an ace-in-the-hole trick. Magician Harry Houdini agreed to teach Robinson one of his best illusions. FOR LOVE OR MONEY After 20 years of being together, Robinson and Path, both in their 40s, decided to do the right thing, so to speak, getting married in a brief civil ceremony in March 1906 in England. The truth was so nebulous by this time, however, that to legalize their relationship only added to the complication. Robinson was technically still married to Bessie, although he claimed to be divorced, and his many affairs made his devotion to Path dubious. One of the objects of his affection, Louise Mary Blatchford, was barely 21 years old, and a year after Robinson was married matters got more complicated when Blatchford revealed she was pregnant. Path was furious because Blatchford insisted that Robinson acknowledge his baby and act like a father, and Robinson, now ready for a family, agreed. He set Blatchford up in a home in west London, and in early 1908 a son was born. Mr. and Mrs. Robinson stayed married for the good of the act and created a business partnership. Path started receiving a weekly salary for being Suee Seen and all of her responsibilities behind the scenes. The members of their troupe referred to them as Mr. and Mrs. Soo, and when Blatchford came for a visit, they called her Mrs. Robinson. When the company wasn’t touring out of the country, Robinson would visit his family on Sunday while Path and Kametaro were responsible for moving the show to the next location and setting up. Robinson built a workshop behind his house where he could build and test illusions. After two more children were born, Robinson spent more time in the workshop than he did with his family. The audience was thrilled that they would be seeing Soo perform “Defying the Bullets.” Toward the end of the show, about 10:45, two volunteers from the audience marked the bullets to be used, and Soo and his assistants got into position. Immediately after the command to fire, Soo staggered backwards and blood started pouring out of his chest. The audience wasn’t sure if this was part of the act until Soo said in perfect English, “Oh my God. Something’s happened. Lower the curtain!” The curtain was dropped and they played a newsreel. Suee Seen rushed on stage, and Soo impelled her to call for a doctor. One stage hand ripped off part of the curtain to keep Soo warm. It took about 45 minutes for doctors to arrive, and by then they could barely find a pulse. A bullet had grazed the heart and fractured the fifth rib upon entering Soo’s body and then exited through the back. It wasn’t until 2:30am that Soo was taken to a hospital, and he died about two hours later. QUESTION: Have you ever promised to keep a secret and then shared it with someone? What happened? Steinmeyer, Jim, The Glorious Deception: The Double Life of William Robinson, aka Chunk Ling Soo, the “Marvelous Chinese Conjurer.” New York: Carroll & Graf Publishers, 2005.